After last night’s storm, most of the “cuttings” (see below) made by Hampshire County’s Highway Department have been filled in (by a concerned resident). Pleasingly, the overnight rain showed that the Drainage Channel takes ALL of the water going down Green Lane (see image right). 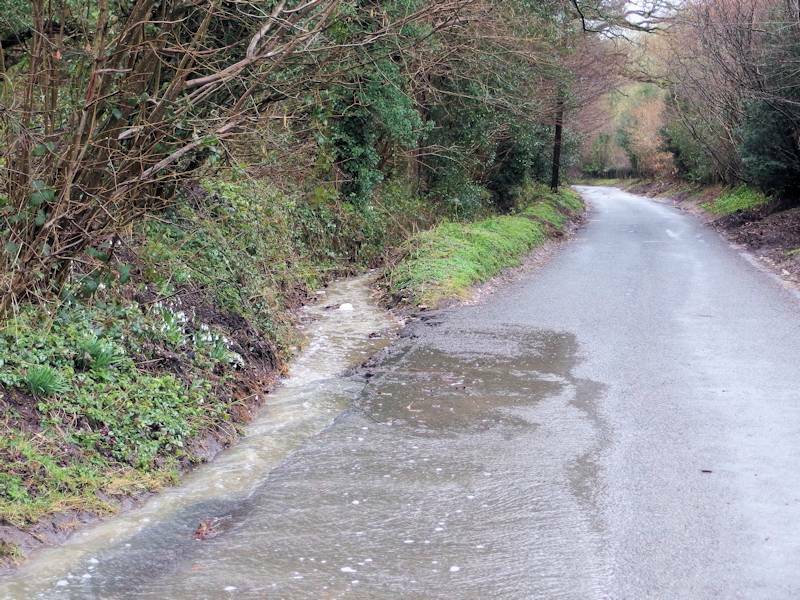 However, the parish council had been warned that the dozen of so cuttings made by the County Council Highways workmen to “take water off the road” in fact would probably do the opposite, in other words TAKE WATER FROM THE DRAINAGE CHANNEL ONTO THE ROAD. As you can see from the image on the right, that is exactly what has happened. Because further down the road it cambers to the right, flood water is then carried down Green Lane and on to Cannon Close and beyond. The parish council has been made aware of the above. EDITOR: To view larger versions of the above photos, click on either image. Other than this breach, the drainage channel is now performing very well, with rainwater carrying on to the Lower Common flood pit. As promised, Paul Turner emailed a report to the Parish Council on Saturday evening. Further to a response from Cllr Guinness, Paul Turner emailed an explanation of why (and how) the council should communicate more with all residents regarding Ellisfield’s drainage. A PDF document of both emails is available for residents to read. More than thirty Ellisfield residents turned up at 10.00am, armed with spades, saws (a couple on 10 foot poles!) and a variety of loppers. One group went up Green Lane and cleared from the start of the Drainage Channel and another group tackled all the overhanging branches in the stretch from the road to the Flood Pit behind Lower Common. Steve Brabbin, in his digger, managed to get into the Flood Pit from Lower Common itself and started to clear the ditch. Once all the overhanging branches had been cut and removed, Steve was then able to move down towards the road. At around 11.30am, everyone broke off to have tea and coffee kindly supplied by Jacqui Matthews (Mayfield) and Alix Taylor (Lower Farm) with more coffee and biscuits supplied by Sheila Brabbin. 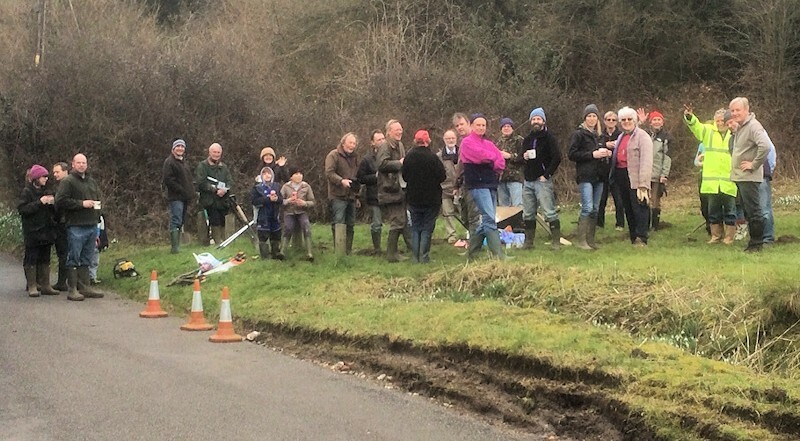 The photo (right) shows most of the volunteers (some were still up the road working and one was behind the camera …). Click on photo to see enlarged image. After the break a group of a dozen or so then tackled the trees along the roadside, including one large tree which was pushing down the overhead telephone cable. Great care was taken here and, once the overhanging branches were cut, Steve Gould removed the trunks with a chainsaw. 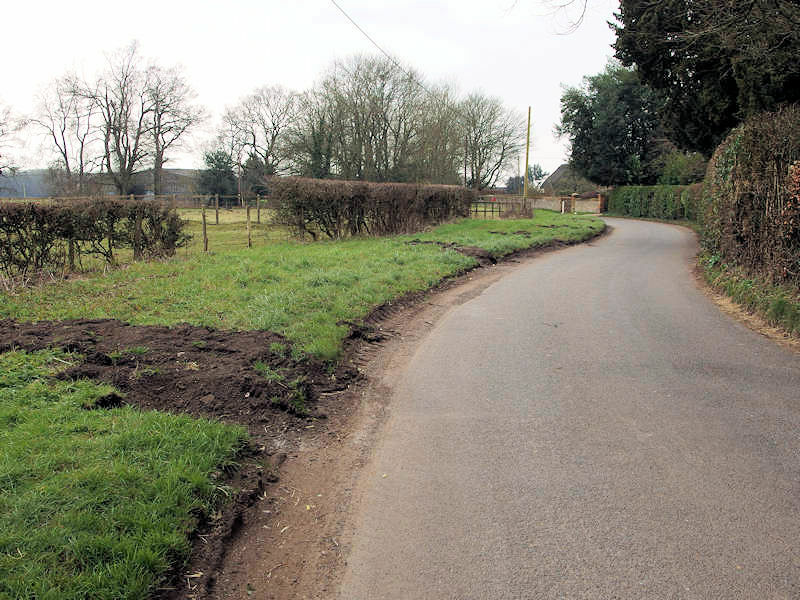 Meanwhile, Steve Brabbin continued with the digger and then, finally, pulled a lot of the top soil down to the road edge and filled in the gap between the Drainage Channel and the road which had breached in the February flash flood and which had then been recently widened (in error!) by the Highways workmen. Many thanks to everyone involved and a very special thanks to Steve Brabbin for all his skilled work with the digger. 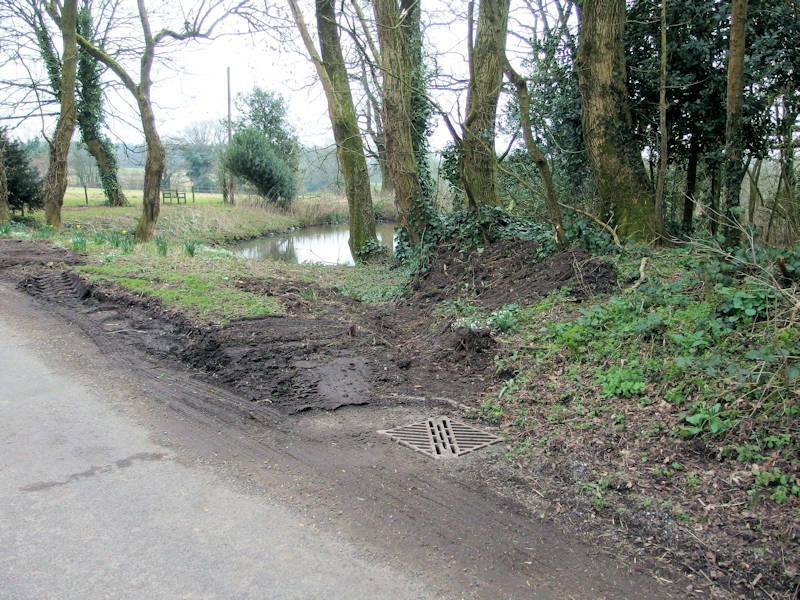 Rain on the previous day proved that the three ditches cut into the verge at the Green Lane Pond (as described on February 25 - see below) were, as expected, useless. It was therefore pleasing to report that an Ellisfield resident (who is highly knowledgeable regarding the Pond drainage) had restored the verge. 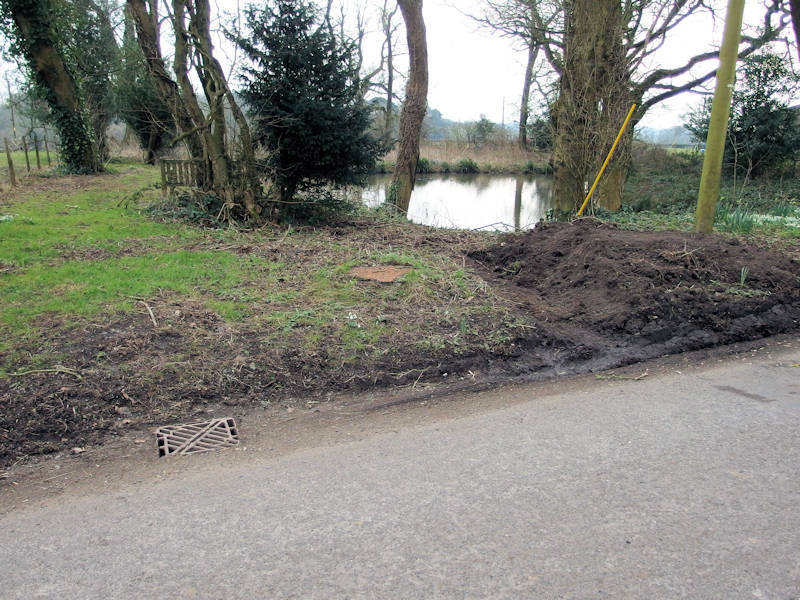 Following a request by the Parish Council, Ellisfield residents were asked to gather at Lower Common on Saturday morning (March 5) at 10.00am in order to clear out the Green Lane drainage channel. Once the channel is cleared, recommendations will be made to the parish council for any further work that may be needed to improve this essential defence to avoid Flash Flooding from going on to Cannon Close and beyond. The Highways “Drainage Map” was produced at this Parish Council meeting and it’s available to display by clicking HERE. (Note that the work done above Hill Farm is not shown.). Residents were more than a little bemused by finding lots of cuttings made in the verges from the top of Green lane all the way down to Lower Common (you can click on any of the images below to view them full sized). 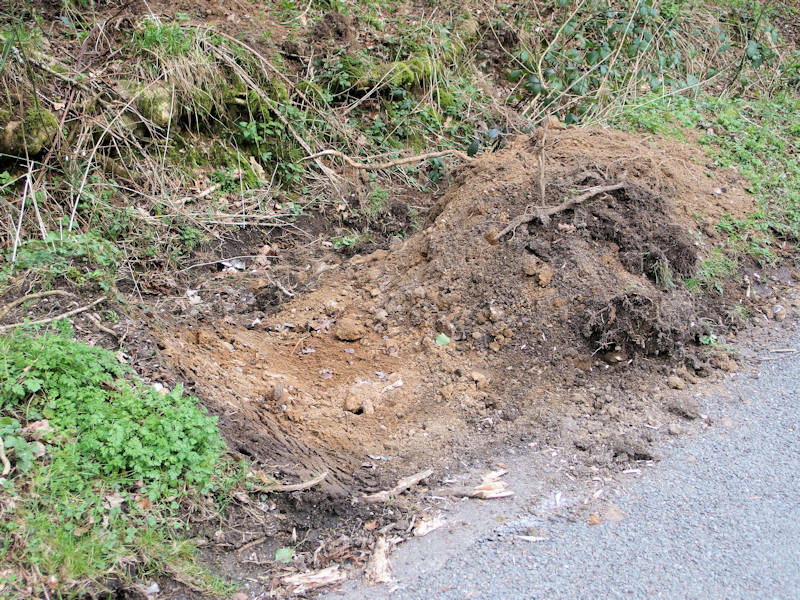 At the top of Green Lane, between the bus shelter and Hill Farm Pond, squares of earth were been dug out of the verge. It was presumed that it’s hoped that the rainwater will soak away into them. However, all the top soil has been cut away, leaving a clay base at road level (including one dug just before a road drain!). 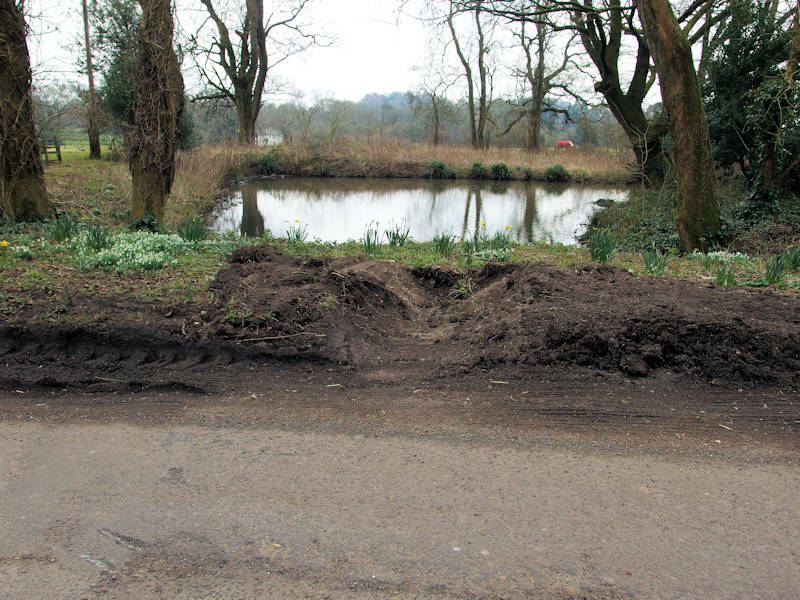 The re was also work done at the Pond itself, with run-offs being dug. The reason is unknown, as the two existing road drains installed during pond renovation work well (providing they are kept cleared of detritus). These three new run-offs seem to have no purpose other than to destroy the view of the pond from the road. Fu rther down Green Lane, 12 or 13 cuttings (see example left) were made between the tarmac and the existing drainage channel. Because of the camber of the road, flood water from the field above Farrier’s Field has always naturally run into this channel (see image right) and on to the flood pit behind Lower Common. It worked successfully during the January flash flood. So, these new cuttings (which are only inches higher than the channel itself) will fulfil no other purpose but to allow water running down the channel to go back onto the road, especially if there is a minor blockage in the channel. Lastly, just before Lower Common itself, where the water broke out of the drainage channel during the last flash flood on February 7, no attempt was made to repair the breach (it was actually been massively widened). So, any future flood water will still continue on to Cannon Close and beyond! 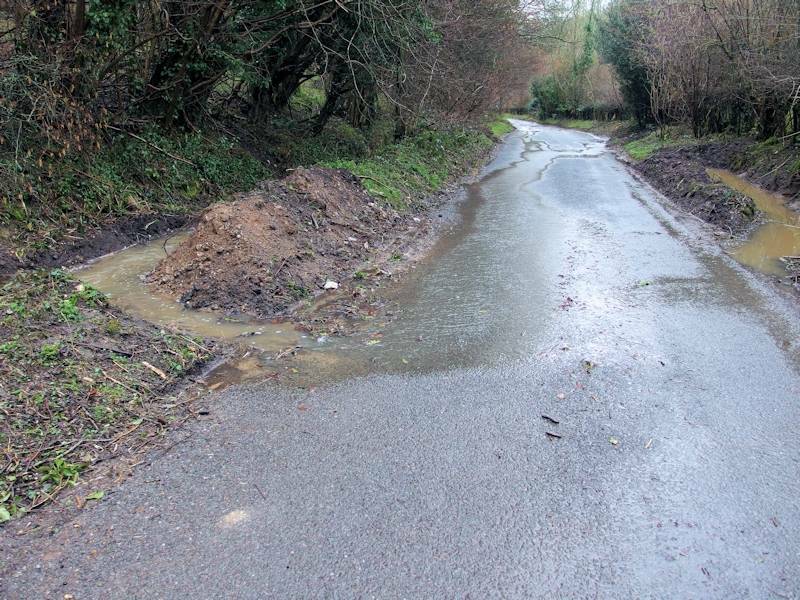 On the night of Sunday, February 7, heavy rain again resulted in the bottom of Green Lane and the Axford Road having deeper flood water than that experienced five weeks before. Despite all the work that had been commissioned by the parish council, this new field run-off showed that there are still weaknesses in our road drainage. 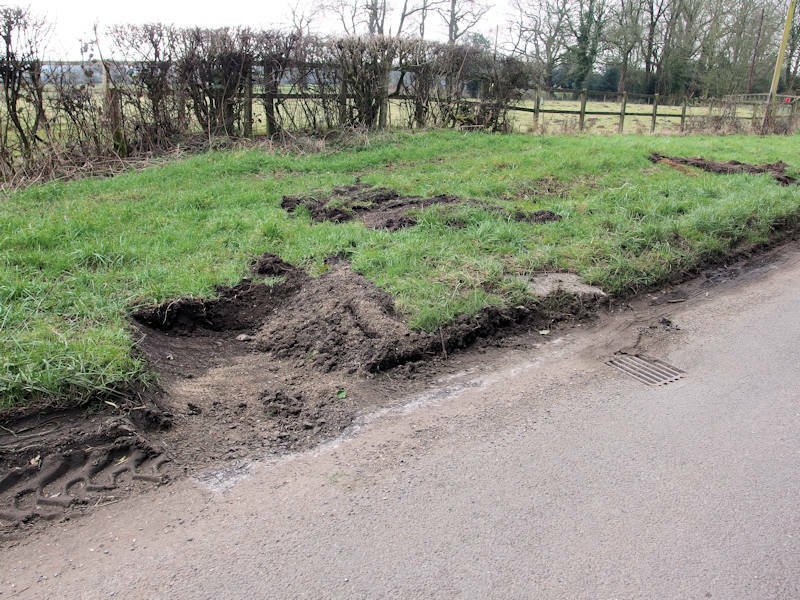 For example, the water flowing from above Farrier’s Field fed very successfully into the drainage channel running alongside Green Lane but, where the water should have turned left to go to the pit behind Lower Common, it instead broke back into the road. Gullies cut into the side of Green Lane simply filled up and the water, now carrying mud, gravel, etc., carried on to the triangle to join up with the flood water which had came down College Lane and onto the Axford Road. Also, run-off from the “ZigZag field” seriously damaged the surface of Fuzzy Lane which has meant that it will be closed to traffic until resurfacing work can be undertaken in, hopefully, a few months time. The open forum commenced with the Chairman, Cllr Tim Guinness, providing a highly detailed explanation of Sunday’s flash flood, what has been done since and also what is being planned to do in the future. The main action has been that many of the grips and drainage channels were cleared out earlier that day using a digger operated by a contractor paid for out of parish funds and another couple of hours of this work is planned for the next day. A resident asked PC Andrew Reid if he would alert the Highways Department to the dangers of the debris and he agreed to do so the following morning. 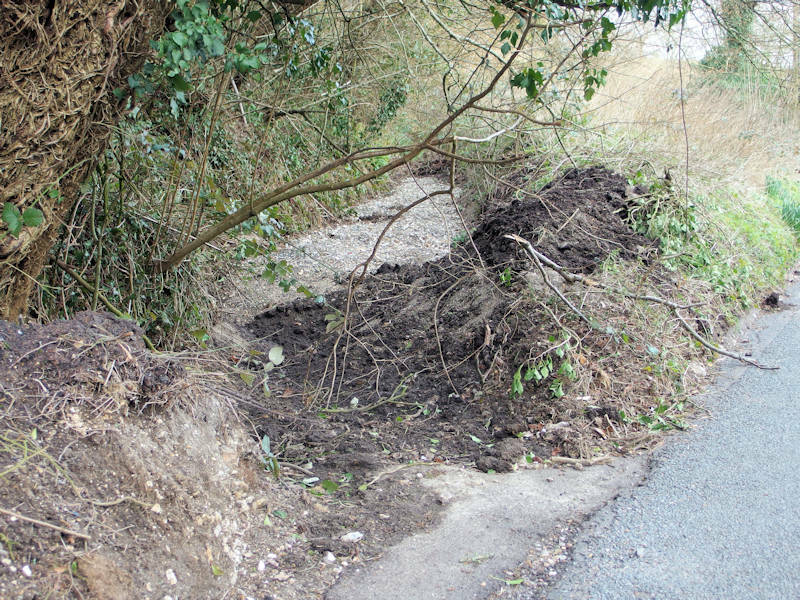 It was pointed out that the area in question is on an official Cycle Route and another resident made it known that he had witnessed a cyclist falling off his bike because of this debris. 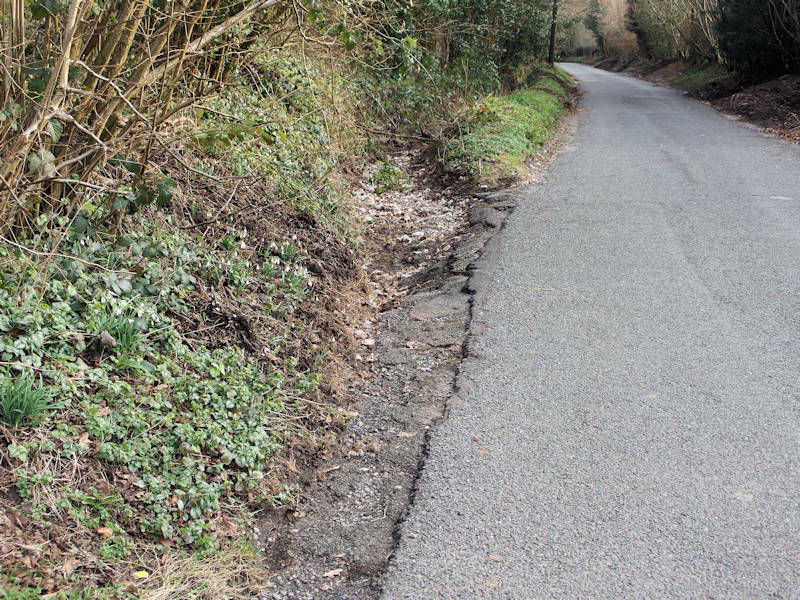 Hampshire County Council’s Highways Department have been requested to clear the debris still remaining on the Axford Road and to repair the damage to the tarmac. They did not provide a timescale for this work (but they did state that it would be within the next two months!). As requested by the parish council, Ellisfield Volunteer Group put a call out for residents to help clear the drainage channels around the village, following the localised road flooding which took place on Sunday. This work was done on an ad hoc basis by residents working independently. On Sunday, January 3, flash flooding turned Green Lane and College Lane into “rivers”. It was made a lot worse by the run-off from the surrounding fields. The bottom of Green Lane and the Axford Road suffered the most, with two cars being seriously damaged with water getting into their air intakes (picture on right was taken by Glen Horgan).